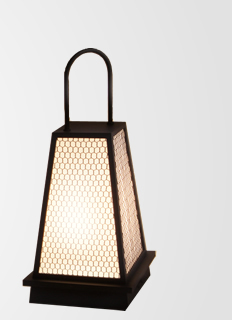 This is an outdoor andon light given a black matte finish the same dark colour as an ubatama Japanese sweet. This type of light, which will gently guide your important guests to the inside of your house through your grounds, is actually made from a single sheet of brass, hence its Japanese name. This brass plate is worked to a thickness of just 0.6~0.7mm. By using this brass plate for everything from the top to the columns and the base plate, we have realized an appearance with lightness and symmetry. Of course, this type of light is resistant to rust, meaning that you can use it outside for many years to come.